Hey President Obama, what about North Korea? Korea remains the forgotten war. Just ask United States President Barak Obama. “For us,” he declaimed at his inaugural, Americans “fought and died, in places like Concord and Gettysburg, Normandy and Khe Sanh”. Korea? The Chosun Reservoir, from which U.S. Marines retreated in bloody defeat in “the coldest winter” of 1950-1951? The Pusan perimeter, which Americans defended against repeated North Korean assaults in the summer of 1950 before driving the invaders out of the south after the Inchon landing? Heartbreak Ridge and Pork Chop Hill – two of the hardest-fought battlegrounds of the Korean War? Forget it. BEIJING/SEOUL (Reuters) – North Korea is committed to removing nuclear weapons from the Korean peninsula and wants to co-exist peacefully, leader Kim Jong-il said on Friday in his first meeting with a foreign envoy since his suspected stroke in August. China’s state Xinhua news agency said Kim made the comments during a visit to Pyongyang by a senior Chinese official. 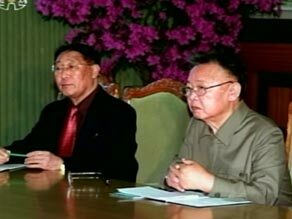 Kim Jong-Il, right, appeared with Chinese official Wang Jiarui. Analysts have said a meeting with a foreign visitor would offer evidence that Kim, who U.S. and South Korean officials said fell seriously ill in August, was well enough to run Asia’s only communist dynasty and make decisions about its nuclear program. “The North Korean side will commit itself to the denuclearization of the North Korean peninsula, and hopes to co-exist peacefully with other involved parties,” Xinhua news agency quoted Kim as saying. You are currently browsing the archives for the Heartbreak Ridge category.